You must sign into your myHangout account in order to contact Tim Sander. I'm playing a lot more with various local old time players in a variety of settings. Taking lessons with Russ Childers. Hoping that the Ohio Arts Council grant for an apprenticeship under him comes through for 2014/2015. I replaced the original PegHeds tuners on my Snakewood/Dogwood Special with antique gold GOTOH tuners. I love them. The PegHeds were nice looking, but squirrelly in function. I also just yesterday installed an HO guage RR spike for a 5th string capo at the 7th on it and on my old Stew-Mac. Both look great and work fine. Got tired of the feel of the end piece of the Earl's Suspender Capo on the 1st string side when playing that fret. I will still use the suspender capo for anything other than 7th fret. That would only be in BG or Gospel music settings, likely. Good sign or senior moment? Tim Sander has 10 friends. View entire friends list. 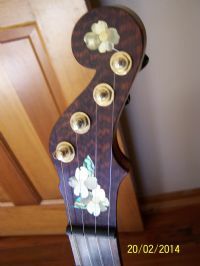 Concert Ukulele built from StewMac kit. Built a Stewart MacDonald kit banjo in the 70's, began learning frailing and dreamed of building banjos seriously. Basically left both efforts in the basement for decades. (Still working on finishing them...big job but its getting close to being done.) Just play clawhammer. Hope to learn to play more as I retire in a couple of years. I picked my banjo up 9 months ago and started playing maybe an hour a day or so. I've learned a lot of tunes and even new techniques since then, but I'm sure I won't get good until I can spend several hours a day practicing after I retire. I'm also getting back into the part time luthier thing and have made some small progress on my two Stew Mac necks from the 70's and had Dan Pennington make rims for them out of the walnut and mahogany I had stored for them since then. As for who I am....I worked as an environmental chemist for 30 years. I'm now doing network security work until I retire in a year or two. I'm a DIY sort and I do most of my own home remodeling/repair, etc. I love dogs. I'm a fan of cosmology and try to understand as much of the development of the frontline theories in physics and understanding the universe as I can. I like kayaking, bicycling, and play volleyball avidly. Pleasure reading usually consists of science fiction when I feel like wasting time. Also a sports fan...which I'm starting to realize is really a waste of time, but addictive, too.... UPDATE: Thhat was about seven years or more ago, I guess. I'm retired and living in the mountains near Asheville, NC now. Still working on the banjo building slowly, but am now also building Ukuleles from StewMac kits. Love it here. Lots of Jams to play in and lots of friends in old time music now.